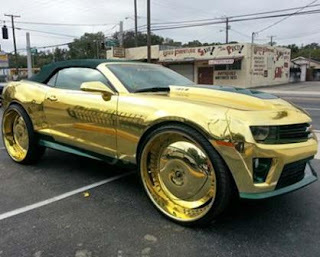 A Tampa preparer developed this modification pony car that stands out very peculiar aesthetics due to its gold plated body. The tuning house 813 Customs created this unique car-based version of the Camaro ZL1 is called King. Although work includes mechanical changes, what really surprises is their aesthetics, that out of the ordinary. The body features chrome gold tinged in green sectors and 30-inch wheels "Forgiato" gold bear the same shade as the rest of your body. In the cockpit you can see the of fiberglass on the board, green upholstery with diamond stitching, an audio system with 9 speakers and three 23-inch monitors in the rear which are connected to a video game system . Under the hood lies a powerful 6.2-liter V8 with numerous enhancements such as the addition of a supercharger, air intakes, a fuel management system and a newly improved exhaust system.